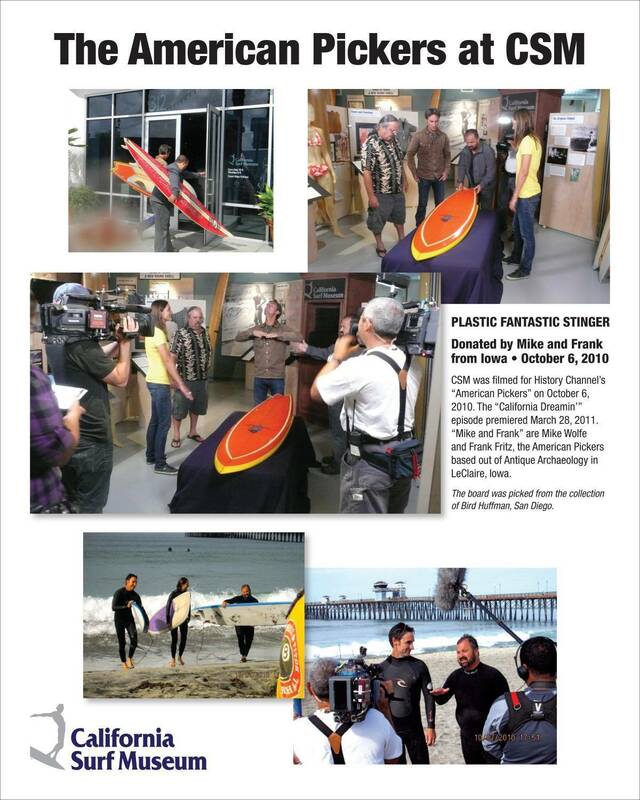 Donated to the California Surf Museum by two corn cobs from Iowa: the American Pickers, Mike and Frank. The Plastic Fantastic Surfboard Company was established in 1968, and built surfboards in small factories in Hawaii and California. After 1972 they were made only in Huntington Beach, California. This mid-1970s stinger style surfboard was made popular by its designer, Hawaiian power-surfer Ben Aipa. 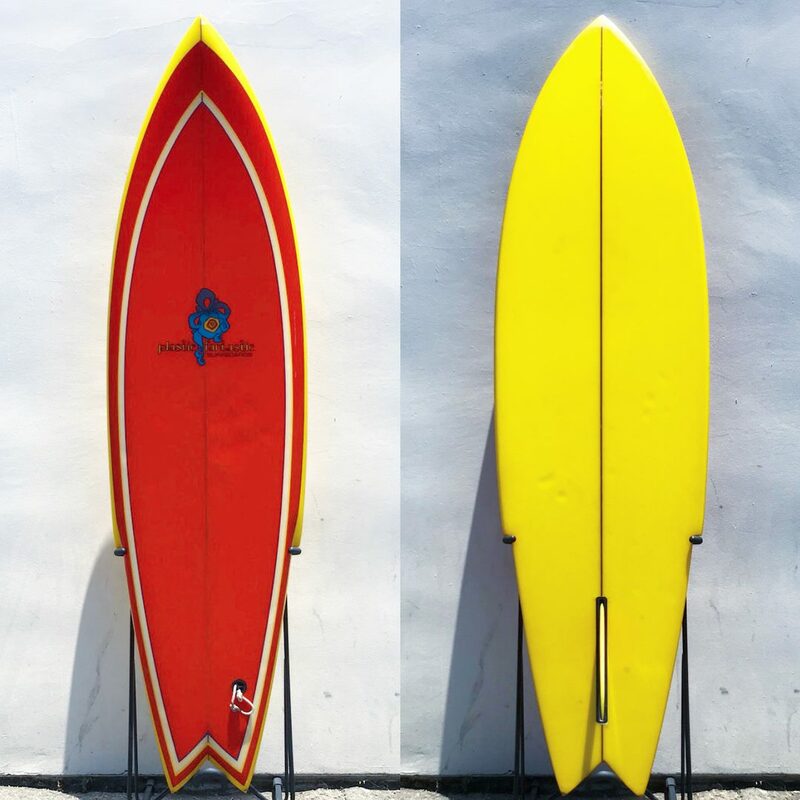 What is unusual about this almost perfect condition surfboard are it’s vibrant colors, both on the deck and on the bottom, contrasting resin pin lines, the brightness of the unpainted white foam, and the matching original fiberglass fin. Filmed at CSM for History Channel’s “American Pickers” on October 6, 2010 the “California Dreamin” episode premiered March 28, 2011. “Mike and Frank” are Mike Wolfe and Frank Fritz, the American Pickers based out of Antique Archaeology in the LeClaire, Iowa. The board was picked from the collection of Bird Huffman, San Diego. Stars of the show – Mike Wolfe and Frank Fritz, visited CSM in October 2011. They met at length with curator Ric Riavic and operations manager Julie Cox and learned the finer points of collecting and putting value on surfboards. The filmed result was a very popular episode that still airs frequently. For assisting them in their research, Pickers donated the Plastic Fantastic board to CSM’s permanent collection. Later in the day Julie scrounged up a couple of boards and wetsuits and took the two off to the Pier for their first surf lesson. The rest is – as they say- history!